. 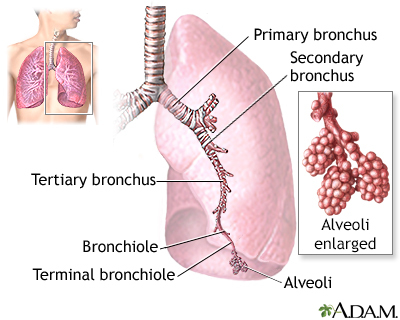 Each lung is composed of smooth, shiny lobes: the right lung has 3 lobes, and the left has 2. About 90% of the lung is filled with air. Only 10% is solid tissue.
) 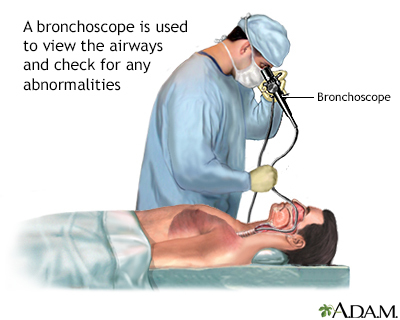 of the bronchi, the major airways. 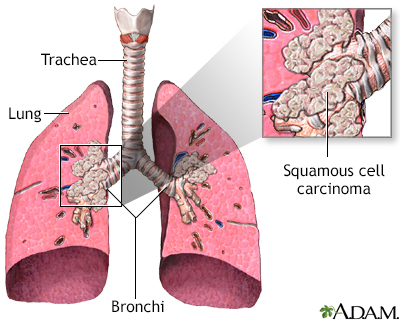 Tumors formed from squamous cells are usually found in the center of the lung, either in a major lobe or in one of the main airway branches. They may grow to large sizes and form cavities in the lungs. EGFR (epidermal growth factor receptor gene) is a family of genes that can mutate and promote tumor growth. 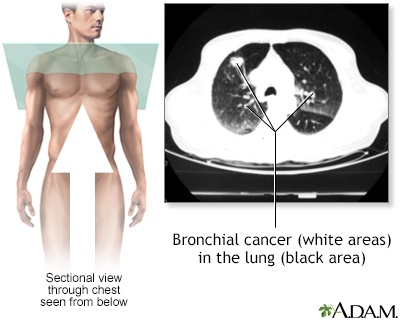 This gene mutation is often implicated in lung cancer in non-smokers. It is most common in Asian populations. HER2 is a related gene under study; it plays a role in regulating cell growth. ELM4-ALK refers to the fusion of 2 different genes resulting in a protein that is found in malignant NSCLC cells that appear to promote its growth. 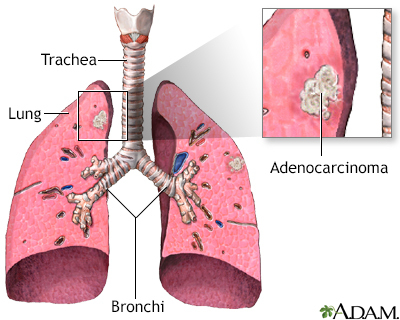 This genetic rearrangement tends to show up in adenocarcinomas in people who have never smoked or in light smokers and younger people. Another important contributor to lung cancer is a genetically defective protein called retinoblastoma (Rb), which is associated with very aggressive tumors. Low levels of the normal Rb gene may sometimes predict aggressive cancer, especially in people with small cell lung cancer. Abnormalities in the FHIT gene. 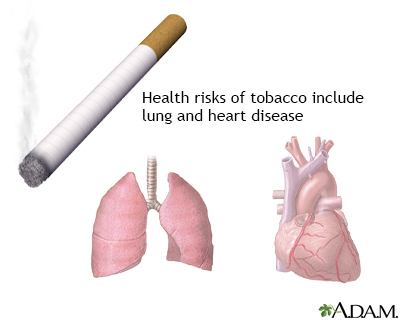 Such abnormalities may cause the cells lining the lung to become more vulnerable to the effects of tobacco smoke and other cancer-causing substances. People who carry a common variation in the gene for alpha1-antitrypsin, a substance that normally protects the walls of the alveoli in the lungs, are 70% more likely to develop lung cancer than those without the mutation, regardless of their smoking history. This common symptom is the result of cancer that has spread in the lung and the pleura, the membrane covering the lung.
. People with this disorder can experience nausea, vomiting, constipation, weakness, confusion, and fatigue. , can produce confusion, weakness, and even seizures. 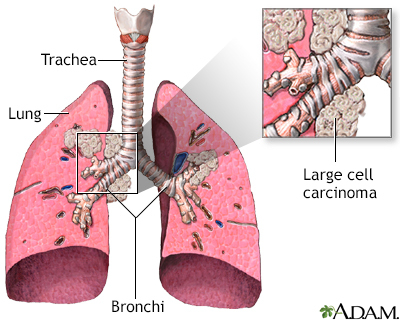 (cancer of the pleura, the lining around the lung) and can increase the risk for lung cancer. With better protective measures, these rates are expected to fall in the future. lung cancer rate, despite their possible occupational exposures to risky chemicals. While this rate has traditionally been attributed to good health habits, including low tobacco use, agricultural workers' exposure to endotoxin may be responsible. Endotoxin is a component of common bacteria found in soil and animals, and it may have cancer-preventing effects on the immune system. Studies on these chemicals are not consistent. 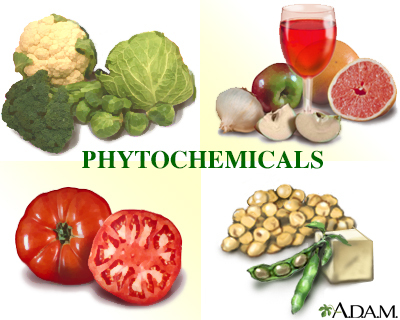 It is unlikely that individual phytochemicals offer protection, but rather that any benefit comes from a collection of vitamins and plant chemicals contained in fruits and vegetables. 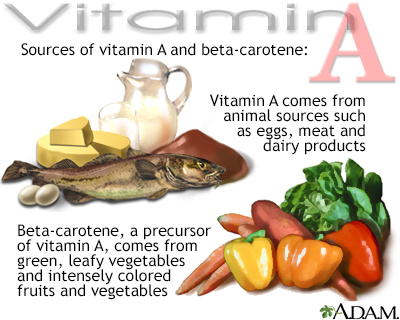 in lung cancer and overall mortality rates among smokers who took beta carotene or vitamin E supplements. 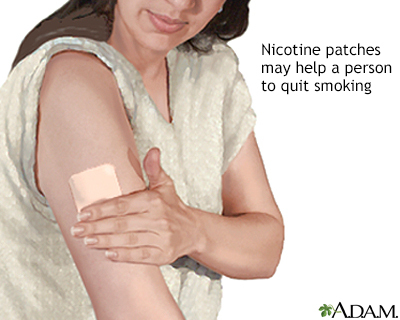 This is particularly important information for smokers, who may carry precancerous or cancerous cells for years before developing the disease. 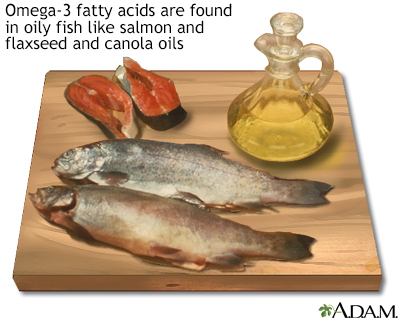 The best way to get healthy levels of important nutrients is by eating healthy foods. Sometimes, a biopsy specimen is obtained by inserting a needle between the ribs, and then guiding it with the use of CT scans, ultrasound, or fluoroscopy (a device allowing an x-ray view). 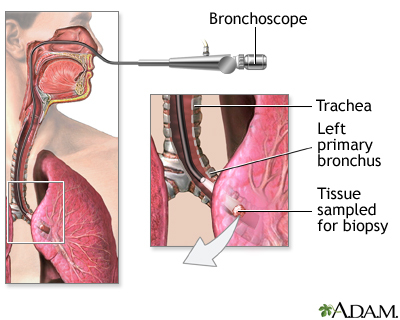 Specific techniques include transbronchial or transthoracic needle aspiration (TBNA or TTNA), endoscopic ultrasound-guided needle aspiration (EUS-NA) and transesophageal endoscopic ultrasound-guided fine-needle aspiration (EUS-FNA). Their use depends on how much of the area can be observed with less invasive imaging methods. There is a 5% to 10% risk for bleeding or collapsed lung with needle aspiration. (VATS), is a less-invasive technique that uses a thin tube containing a miniature camera and surgical instruments. It involves much smaller incisions than open surgery (thoracotomy) and speeds recovery to the point that people are up within hours. Though the procedure is not appropriate in all cases, it offers significant advantages, especially in older or frail people. The death and complication rates following VATS are lower than those after conventional surgeries. Pain is less, and people are released from the hospital quicker. The number of VATS surgeries has steadily increased every year as physicians gain experience with the technique. Initially it was primarily used in wedge resections, but is now used for lobectomies and segmentectomies as well. the cancer from damaging the brain. 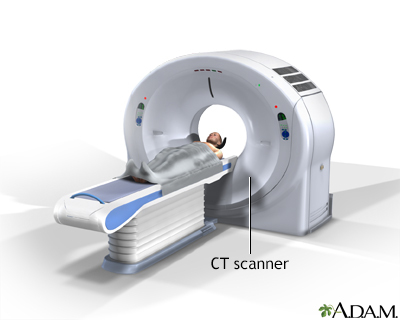 External-beam radiation therapy focuses a beam of radiation directly on the tumor. 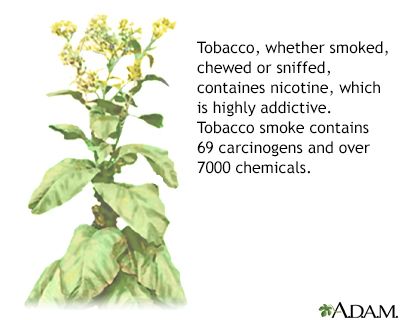 It is generally used for cancer that has spread. Brachytherapy implants radioactive seeds through thin tubes directly into the cancer sites. 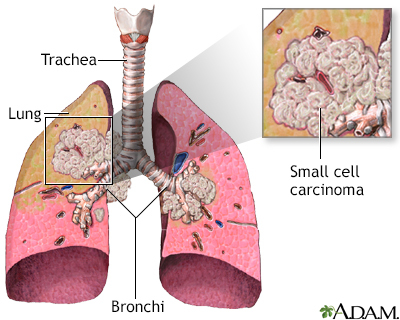 Brachytherapy may be used for lung cancers that have spread to the throat and caused obstruction. High-dose-rate brachytherapy may also have some value for people with inoperable tumors in the central region of the lung. Docetaxel is usually given every 21 days. 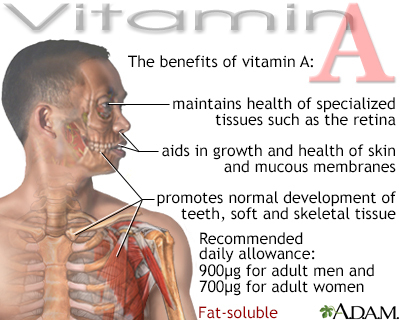 This regimen causes more side effects than pemetrexed (Alimta). Weekly doses of docetaxel (Taxotere) are effective and less toxic than the 3-week schedule. It is not clear if the weekly schedule achieves survival rates comparable to those of pemetrexed (Alimta). Pemetrexed, a first-line treatment of nonsquamous NSCLC in combination with cisplatin (Platinol), is also approved as a single second-line treatment of the same type of cancer. 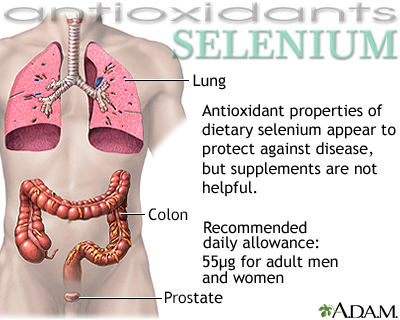 It is less toxic than docetaxel (Taxotere). 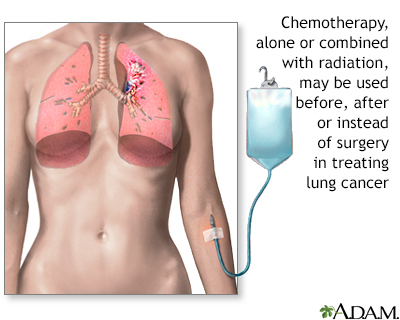 Some targeted biological agents, such as erlotinib (Tarceva) or pembrolizumab (Keytruda), may be used if chemotherapy fails.